The plan was developed by teachers and instructional staff from throughout SISD, along with parents, and community representatives. allows Texas districts to qualify as a District of Innovation. that are currently under the control of the Texas Education Agency. House Bill (HB) 1842, passed during the 84th Legislative Session, permits Texas public school districts to become Districts of Innovation and to obtain exemption from certain provisions of the Texas Education Code. • Flexibility: Districts will have the flexibility to implement practices similar to charter schools, including exemptions from certain mandates including the uniform school start date and required minutes of instruction. • Local control: Districts decide which flexibilities best suit their local needs. • Autonomy: Districts must submit a district of innovation plan to the commissioner of education, but approval is not required. The term of the Plan is for five years, beginning April 23, 2018 and ending April 22, 2023, unless terminated or amended earlier by the Board of Trustees in accordance with the law. If, within the term of this Plan, other areas of operations are to be considered for flexibility as part of HB 1842, the Board will appoint a new committee to consider and propose additional exemptions in the form of an amendment to the Plan. Any amendment adopted by the Board will not extend the term of this Plan. The District may not implement two separate plans at any one time. TEC 25.0811 states that a school district may not begin student instruction before the 4th Monday of August. TEC 25.0812 states that a school district may not schedule the last day of school before May 15. 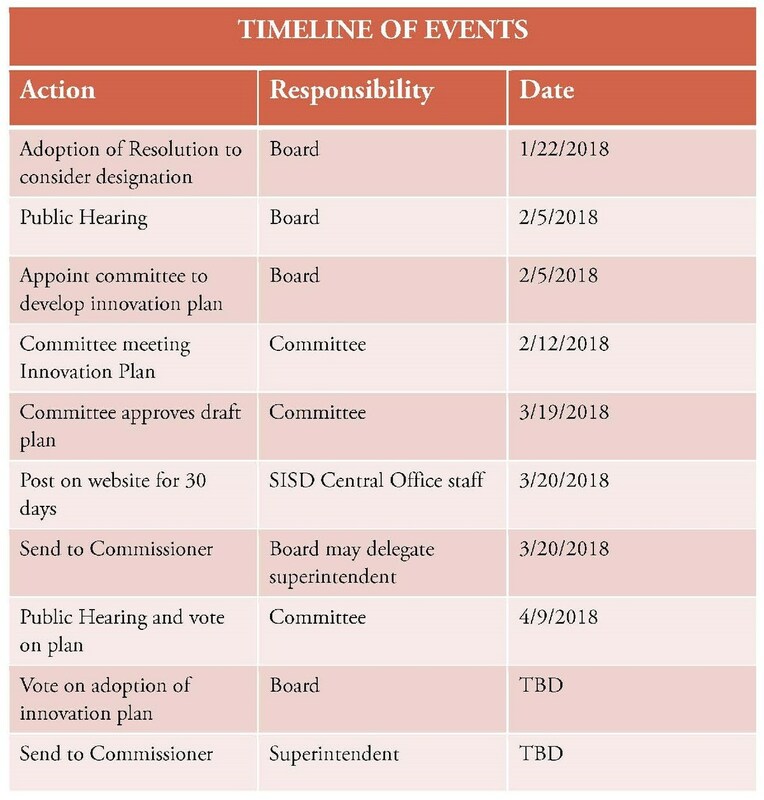 The current process allows no flexibility in the design of annual calendars to fit the needs of the community or the wishes of the local Board of Trustees who represent community interests in this matter. Previously, districts had the option of applying to TEA for a waiver to start earlier, even as early as the 2nd Monday in August. The Texas tourism groups lobbied to have this stopped because they believed it was hurting their tourism business. Therefore, several years ago the legislature took away all waivers and dictated that districts may not begin until the 4th Monday, with no exceptions. This flexibility of start date allows the district to determine locally, on an annual basis, what best meets the needs of the students and local community. This empowers us to personalize learning, increase college and career readiness, and balance the amount of instructional time per semester. In addition, by having the flexibility in the start and end of the school year, students will be able to enroll in college courses that start in early June, thereby increasing college and career readiness. Removing the uniform start date could also let the SISD start classes as a short week, easing the transition for students entering kindergarten, middle school, and high school. This will also allow for more flexible professional development opportunities for our staff. TEC 25.081 requires that a school district provide at least 75,600 minutes of instruction each school year, including intermission and recess. School districts must seek a waiver of this requirement from TEA in order to provide fewer than the required number of instructional minutes in the case of natural disaster or calamity. This requirement restricts the District in the development of the academic calendar, including the scheduling of early release days and staff development days. The flexibility to adjust minutes of instruction will assist with personalizing learning to better meet individual student needs. It also has the added benefit of allowing the possibility of an altered length of a school day, which may include, for example, a later start/early release time which will accommodate additional professional development/collaboration opportunities. Smithville ISD will follow the required operational and/or instructional minutes/days as defined in the Student Attendance Accounting Handbook (SAAH). Kindergarten – 4th Grade classes are to be kept at a 22 student to 1 teacher ratio according to state law. When a class exceeds this limit, the district must complete a waiver with the Texas Education Agency. These waivers are never rejected by TEA. This is a bureaucratic step that serves no purpose. Along with the waiver, it is required that a letter is sent home to each parent in the section that exceeds the 22:1 ratio, informing them the waiver has been submitted. Many times soon after the waiver is submitted, students move out of the district and we are below the 22:1 ratio. Smithville ISD believes that small class size plays a positive role in the classroom; this must be balanced with the logistics of the timing of adding staff, and the best teacher to student ratio that can be achieved given the total number of students. We do not believe it has a negative effect when a district adds only one or two more students. Many times it is not the number of the students but the makeup and chemistry of the classroom which influence the learning environment. Most importantly, research clearly shows it is the teacher in the classroom that has the greatest impact on student learning, not absolute class size. In the event the class size exceeds the 22:1 ratio for Kindergarten – 4th grade classes, a TEA waiver will not be necessary, but the superintendent will report to the Board of Trustees for approval. Therefore, if registration before the start of school warrants additional staff to meet the 22:1 ratio, SISD will review staffing needs. This exemption only allows SISD the local control over class size ratios, not a disregard for the intent of the ratio requirements. This plan also emphasizes the importance of flexible learning environments and student learning based upon student driven passions and needs. This grants flexibility in class size at all times-regrouping for success, small groups, large groups, etc. It also works to minimize paperwork requirements in order to free up time to place additional focus on student success. An exemption in meeting Texas Education Code (TEC), §25.112, will allow the ability to group students based upon academic, social, and emotional needs without adding ongoing filings of waivers when the need arises. In the event a district cannot locate a certified teacher for a position or a teacher is teaching a subject outside of their certification, the district must submit a request to the Texas Education Agency. TEA then approves or denies this request. There is a lot of bureaucracy and unnecessary paperwork involved in the process. SISD is committed to placing a certified teacher in every classroom. In order to best serve SISD students, decisions on certification will be handled locally. The current state teacher certification requirements inhibit the District's ability to hire teachers to teach hard-to-fill, high demand dual credit, and career and technical/STEAM (applied Science, Technology, Engineering, and Arts & Mathematics) courses. In order to enable more students to obtain the educational benefit of such course offerings, the District seeks to establish its own local qualification requirements and its own requirements for training of professionals and experts to teach such courses in lieu of the requirements set forth in law. This exemption directly supports the move from “highly qualified” requirements in the Every Student Succeeds Act (ESSA). By obtaining exemption from existing teacher certification requirements, the District will have the flexibility to hire community college instructors, university professors, or internal applicants seeking assignments outside of their traditional certification area. The exception would not include special education and bilingual teachers; they must continue to be SBEC certified. This will enrich applicant pools in specific content areas and afford more students the opportunity to take dual credit courses if certified teachers are not available to teach those courses. In addition, this exemption will afford the District the flexibility to hire professionals in certain trades or vocations to teach the crafts of those trades or vocations (such as welding, fine arts, health sciences, law, etc.) if certified teachers are not available to teach those courses. TEC 21.102 states that a probationary contract may not exceed one year for a person who has been employed as a teacher in public education for at least five of the eight years preceding employment with the District. In this statute, “teacher” means a principal, supervisor, classroom teacher, school counselor, nurse, or other full-time professional employee. This statute in the TEC provides a three-year probationary period for newly hired teachers and only a one-year probationary period for teachers who have been in public education for at least five of the previous eight years. This limited period of time may not be sufficient to evaluate the employee’s effectiveness since contract timelines demand that employment decisions must be made prior to the end of the school year. Upon exemption from TEC 21.102, SISD will have the flexibility to extend a probationary contract for all professional employees in order to allow ample time for the District to fairly and thoroughly assess an employee’s performance. Experienced teachers new to the District that have been employed in public education for at least five of the previous eight years may be issued a probationary contract for up to two years from the date of District employment. District employees currently holding a probationary contract for the 2017-2018 school year, that have been employed in public education for at least five of the previous eight years, may be issued a probationary contract for up to two years from the date of District employment. Currently, under TEC 25.036, a district may choose to accept, as transfers, students who are not entitled to enroll in the district, but TEC 25.036, has been interpreted to require a transfer to be for a period of one school year. Smithville ISD maintains a transfer policy under FDA (Local) requiring nonresident students wishing to transfer to file a transfer application each school year. In approving transfer requests, the availability of space and instructional staff, availability of programs and services, the student's disciplinary history records, work habits, and attendance records are also evaluated. Transfer students are expected to follow the attendance requirements, rules, and regulations of the district. TEC 25.036 has been interpreted to establish the acceptance of a transfer as a one-year commitment by the district. The district is seeking to eliminate the provision of a one-year commitment in accepting transfer applicants. On rare occasions, student behavior warrants suspension (in or out of school), placement in a disciplinary alternative program, or expulsion. In addition, student attendance may fall below the TEA truancy standard. 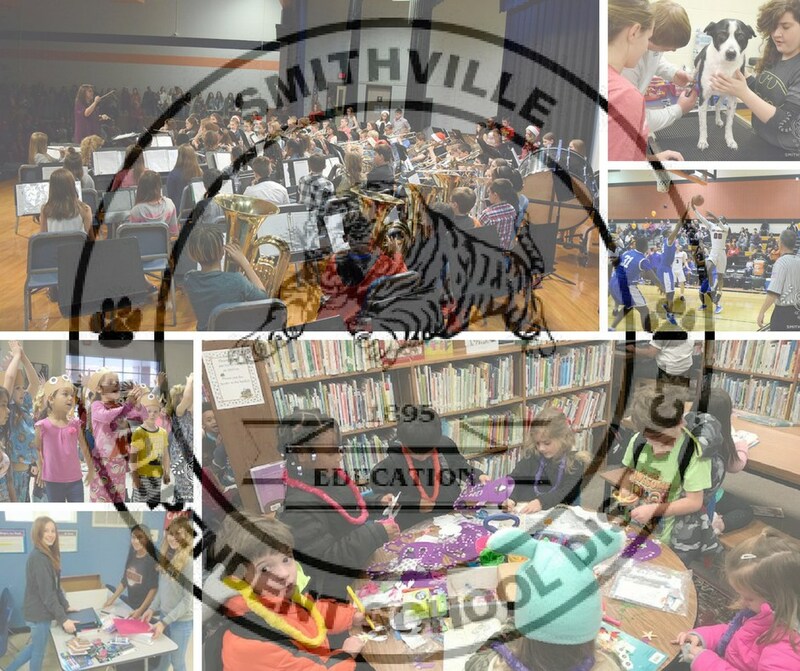 In these rare cases, Smithville ISD seeks exemption from the one year transfer commitment. Nonresident students who have been accepted as inter-district transfer students may have such transfer status revoked by the Superintendent at any time during the year if the student is assigned discipline consequences of suspension (in or out of school), placement in a disciplinary alternative program, or expulsion. In addition, students not meeting the State's 90% attendance standard may also be subject to immediate revocation of the transfer status. In addition, Smithville ISD will accept, as transfers, students who are not enrolled in the district, pending a review of applications at the mid-year point or end of semester. Student’s approval process for transferring depends on the availability of space and instructional staff, availability of programs and services, the student's disciplinary history records, work habits, and attendance records are also evaluated.